When the Second Intifada broke out, Matan’s unit was sent to the Gaza Strip. There he encountered areas filled with explosive devices and booby traps. One of those devices went off, wounding him severely and killing three of his friends. What it took for Matan to get to the point where he could show off his prosthetic leg to kids is nothing short of miraculous. His story will bring tears to your eyes – and a smile to your face when you realize how much your support of Friends of Israel Disabled Veterans (FIDV) has meant to this special young man. Matan comes from a family of deeply dedicated Zionists. His grandfather was critically wounded by a land mine while serving in the Jewish Brigade. In the Israel Ministry of Defense, he’s known as Disabled Veteran #24. Matan’s father served for many years in the Israeli Navy. So when Matan came of age, there was no question about what he was going to do. He wanted to join the most prestigious combat unit he could. 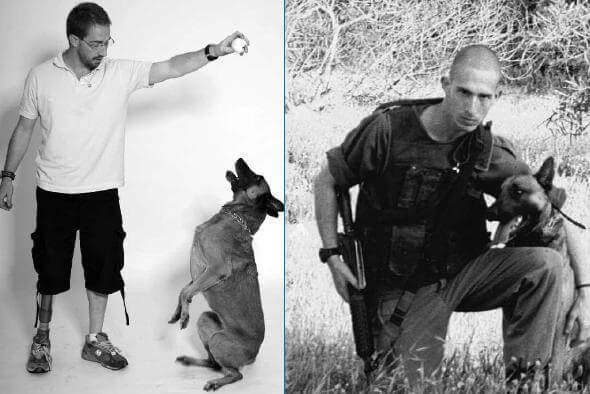 His love of dogs lead him to enlist in the IDF’s special forces Canine Unit, OKETZ, part of the paratroopers. His leg, which was injured during training, now was far worse. A routine surgery that was supposed to fix the problem didn’t work. Matan was left in excruciating, unrelenting pain. As if this wasn’t horrendous enough, Matan was plagued by terrible post traumatic stress syndrome (PTSD) that went undiagnosed for years. He blamed himself for the loss of his three friends even though an army investigative report concluded that he could not have saved them. Matan was suffering horribly – physically and psychologically – even attempting suicide on several different occasions. He finally ended up in a psychiatric facility where he underwent intensive treatment for his PTSD. One of his psychiatrists sent him to a rehabilitation hospital where he was diagnosed as suffering from a rare Chronic Pain Syndrome. He was relieved when it was determined that his leg needed to be amputated. Last year, the surgery took place and the anguished-filled years of pain were finally over. But the long road to learning how to function with a prosthesis and to overcoming PTSS, was just beginning. It was then that Beit Halochem came into Matan’s life. He’d been having physiotherapy twice a week. Now, with great determination, he began swimming vigorously at Haifa’s Beit Halochem. Then he started riding a hand bike and taking skiing courses on the slopes of Mt. Hermon. He has even become a member of the wheelchair dancing troupe at Beit Halochem. Every new skill he acquired at Beit Halochem has bolstered Matan’s strength and his courage. And the friends he has made there – all wounded soldiers like himself – have given him a bond of companionship and support he thought he’d lost forever. Beit Halochem has opened up a new world of hope for Matan, a world in which he can, for the first time in so long, see a future for himself. And this was all made possible because there are caring people like you who have deep respect and affection for the wounded veterans of Israel Defense Forces like Matan. I want to offer you my deepest gratitude for all you have done for Matan and other brave young people like him who have sacrificed so much to defend the Jewish homeland for all of us, and who surely deserve all the help we can provide. And as we approach Chanukah, the holiday of miracles, I want to ask you please continue to enable Beit Halochem to make miracles of healing and hope happen for more wounded Israeli soldiers like Matan by making the largest tax-deductible gift you can to Friends of Israel Disabled Veterans at this time. When you do, you will be demonstrating your profound appreciation – in a very real way – to those who protect Israel on behalf of Jews around the world. You will be making it possible for us to take in more wounded soldiers, many of them from Operation Cast Lead this past January, who urgently need the specialized therapies that only Beit Halochem provides. On behalf of all of us, but most especially on behalf of the disabled veterans like Matan who your wonderful support helps, I want to again thank you and offer our best wishes for a joyous and light-filled Chanukah for you and those dear to you. The dog Matan trained with in his combat unit, Nikki, is now living with him. When Matan’s unit commander heard about his condition, he decided to release Nikki from active duty long before her time was up so that she could help Matan. It has been wonderful for Matan, and for Nikki, too. If you ask Matan, knowing the pain and anguish he has endured, if he would enlist into a combat unit again, he’ll tell you straight out that he absolutely would, no questions asked. This kind of courage surely deserves all the help we can give. Your support of Friends of Israel Disabled Veterans – Beit Halochem makes that help possible. Thank you.